Shane Acker's new post-apocalyptic animated adventure 9 began its life as the young director's thesis project during his grad school days in UCLA's animation department. dolls loosely stitched together out of whatever odds and ends survived the unseen cataclysm. as James Cameron's Terminator films, Acker created his own distinct futurescape that won the applause of audiences, several awards (including a 2005 Oscar nomination for Best Animated Short) and, best of all, the attention of A-list movers-and-shakers like Tim Burton, who set him up with the funds to turn his short into a full-length feature. Wisely adhering to that old maxim “If it ain't broke, don't fix it,” Acker uses this opportunity to expand the scope of the original short without fundamentally altering his vision to appeal to a broad mainstream audience. His only major marketplace concession was giving his characters voices, a decision that, while understandable, also turns out to be the film's most significant creative misstep. Clocking in at a swift 80 minutes, 9 unfolds almost in real time at a breakneck pace. 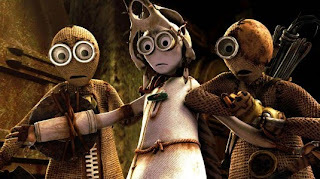 As in the short, viewers experience events through the eyes of the title character (voiced by Elijah Wood), one of nine dolls whose origins are shrouded in mystery. The movie begins with 9 gaining consciousness in a dilapidated room in a bombed-out building inhabited only by a long-dead body. Venturing outdoors, he crosses paths with another one of his kind, who escorts him to a carefully hidden bunker where the surviving dolls live, making sure to avoid the mechanical creatures that roam the ruins hunting down any remaining signs of life. At the hideaway, 9 trades angry words with the group's leader 1 (Christopher Plummer) over whether any attempt should be made to learn why the planet was reduced to rubble. While 1 favors inaction, 9 and the equally rebellious 7 (Jennifer Connelly) can't allow themselves to stand by idly. Venturing into the open, they're forced to outrun killer robots and explore uncharted territory in an effort to learn the reasons behind their existence…and what happened to their creator. As a purely visual experience, 9 more than holds its own with the best dystopian sci-fi tales—films like Blade Runner, The Road Warrior and Pixar's Wall-E. In addition to inventive character design and dazzling CGI landscapes, Acker imbues the world with a wonderful tactility. Instead of wielding advanced technology, the characters have to fashion tools and weapons out of whatever is at hand in the giant landfill that is this future Earth. It's just a shame that these exceptional visuals aren't accompanied by equally strong dialogue and vocal performances. Burton tasked his Corpse Bride collaborator Pamela Pettler with turning the silent short into a talkie, but her words end up adding very little to the proceedings. Truth be told, 9's narrative is straightforward enough that it doesn't really require dialogue, except perhaps in a few key scenes. More often than not, the characters end up spouting basic exposition and observations that could just as easily be communicated visually. In the case of a film like 9, the pictures really do say a thousand words. movie Up will screen for the first time at New York Comic Con. who spent his entire life dreaming of exploring the globe and experiencing life to its fullest. But at age 78, life seems to have passed Carl by, until a twist of fate (and a persistent 8-year old Wilderness Explorer named Russell) gives him a new lease on life. Pete Docter and begin at 6:30 PM on Saturday, February 7 in the IGN Theater inside NYCC. Methinks you should get on line Friday.